I had a quiet day at work on Monday and so I finally finished mark 2 of the collar, and sewed it on to an old cardigan. I have never actually worn my own work before and feel a bit embarrassed about it. Still, I am showing you guys, and if it looks too awful I can always remove it! Then I started a doily in "Stardate". This doily is called "Libra" and is from the first book by Pascal Provost. "So, David, what are you?" "Well, like Taurus, Herpes, Pisces...you know." "Er, Herpes isn't a sign..."
"Generally it's a sexually transmitted disease..."
Actually Raph was born at the end of December, which makes him a Capricorn, and pretty difficult to live with. As we keep reminding him, Jesus was a Capricorn and they ended up crucifying him! Snowy who is Pascal? This doily looks like its going to be a real treat! I think the collar looks perfect! Quite understated, and it seems to be the fashion just now, having lace on tops and t-shirts. Usually, in the shops, it's crochet, of course, so the tatting is extra-special. It would also look stunning if you were to make another one in a toning colour, perhaps a shade or two darker than the garment. Thank you for the information about the tatting book, as I can read French, I have almost made up my mind about the purchase! The collar is gorgeous, and certainly nothing to be embarrassed about! I'm not familiar with the book by Pascal Provost. I guess I'll have to check it out! Interesting conversation about astrological signs... I'm not into that myself. I do know that I'm a Gemini, but that's about it. There are other doilies by her in my 2008 archives, if you are interested? I was teasing, Diane, but I know some people are quite passionate about it. Hi, brilliant guesses thankd :-) I will post your comment in a few days just so anyone reading the other blog can have a try, the missing one was CD's, stacked on spindle sat ny my computer ready to by written on! I like that collar! Like you, I have been hesitant about wearing my tatting, but after seeing this I am closer to actually doing it! I think it looks great! The doiley and thread look like a match made in heaven, both superb. Loved the star signs story!! Your work is beautiful. 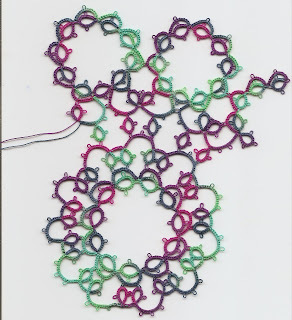 I don't know much about Tatting, but it's certainly caught my eye. I'd love to hear more about this interesting creative process. There's so much talent on this site, that I'm finding myself getting lost in it all. I recently started my own art business and enjoy every moment of the creative process and where it takes me. Most of all seeing that final product is what inspires me to move on to the next phase of work. If you're interested in checking out my blog your more than welcome to. I also have an art website. You'll have to explain to me more about this whole tatting process. I love that little collar--it looks so dainty!